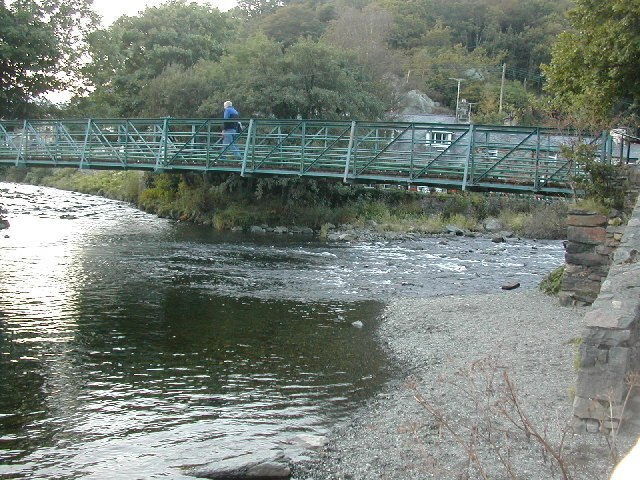 The Glaslyn Footbridge spans the Afon Glasgyn immediately downstream of its confluence with the Afon Colwyn. It connects the river path leading from Ty Isaf with the green near Meirion Terrace and Sygun Terrace. © Philip Halling. Licensed for reuse under a Creative Commons Licence. © Peter Shone. Licensed for reuse under a Creative Commons Licence. 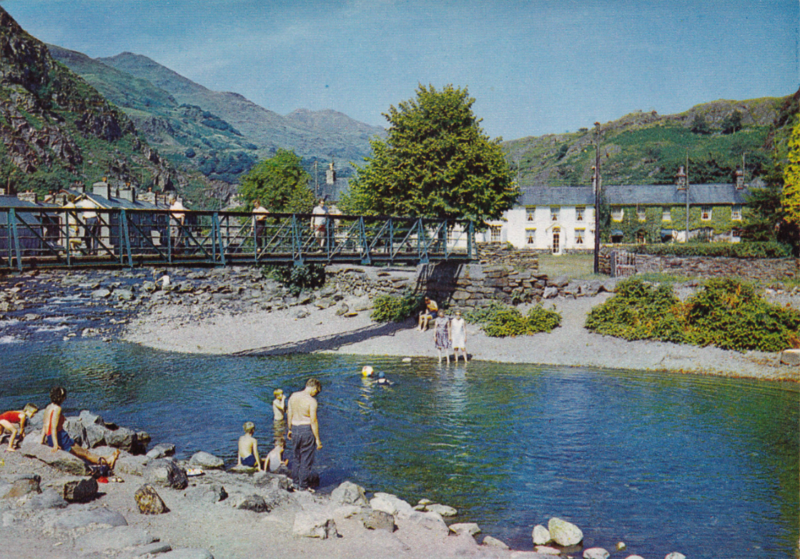 The footbridge was constructed in 1951 at the Glaslyn Foundry at Porthmadog (Portmadoc). 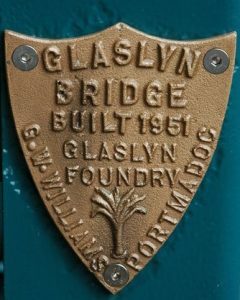 Plaque on the Glaslyn Footbridge, 2007. © Philip Halling. Licensed for reuse under a Creative Commons Licence. Previously a much wider bridge had existed. The first known bridge at this point was constructed in 1871. It was known as Pont Fawr. 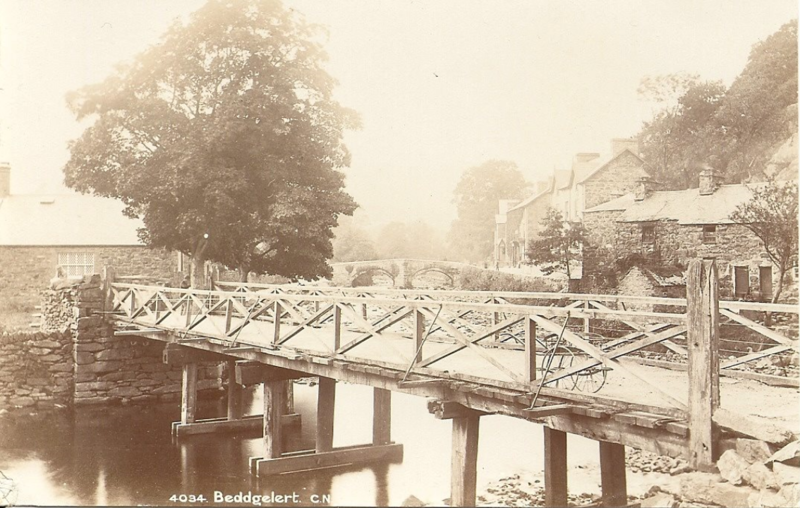 The attractive village of Beddgelert has been made additionally picturesque by the construction of a fine bridge, of the best materials and workmanship, connecting the houses on the island at that place with the main road. This has given accommodation to the poorer inhabitants, and to the public generally, which has long been felt. The expense of the work has been generously borne by the respected owner of the property, J. R. Ormsby Gore, Esq., M.P., Porkington; and that gentleman’s efficient agent, Mr J. Parry, Glynn Hall, has, by the inauguration of this convenience, deserved and obtained the thanks of many. 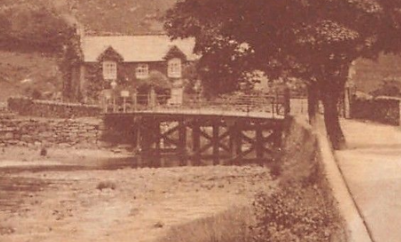 The flood at Beddgelert rose to a great height. 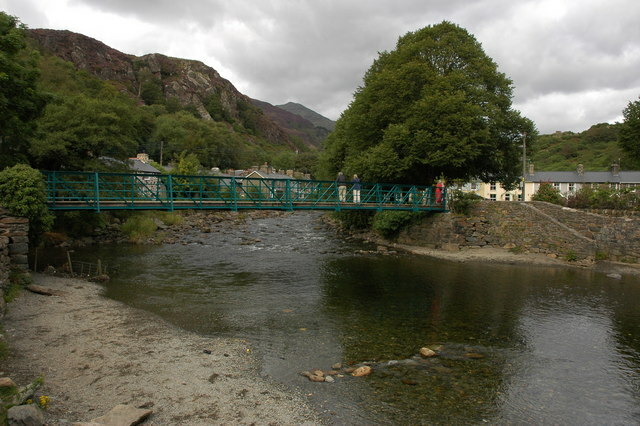 The “Pont Fawr,” which crosses the Glaslyn (close to the confluence of the Gwynant and the Colwyn), was swept away. It was a wooden structure, erected about thirty years ago. A party of five young people from Birmingham were driving over the temporary structure which has been erected since Beddgelert Bridge, in Carnarvonshire, collapsed in the recent flood, when the horse swerved, and caught the bridge railing. The latter gave way, and the trap, with five occupants, fell into the Colwyn river. Fortunately the water was only three foot deep at the spot where they alighted, and nobody was seriously injured. Miss Nora Fitchett, who fell under the vehicle, was severley bruised, and the others slightly. There were seven people in the trap at the time of the accident, including the driver, but two of them, Mr. J. Milligan and Mr. D. Ewen, managed to jump off as it fell. The ‘temporary’ wooden structure is shown below looking from the Meirion Terrace side towards the main road bridge. Crossing the bridge took you from Merionethshire into Caernarvonshire. The following image is looking towards Meirion Terrace and the wooden bridge from the path near Ty Isaf. The supports beneath the bridge have been strengthened with diagonal struts.